A clean, crisp copy in a beautiful recent leather binding. 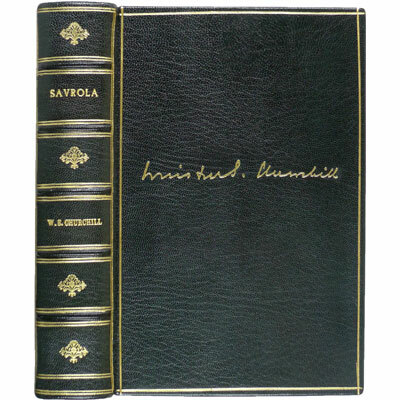 Written when Churchill was 23 and first appearing in serial form in ‘Macmillan's Magazine’, Savrola was Churchill's only novel. It embodies his personal philosophy on life, which was to govern his later military and political career. A bright set complete with scarce dust jackets. Seven first edition volumes of monumental orations from Britain's war leader, compiled by Randolph S. Churchill and Charles Eade. Illustrated with half tone plates mostly from photographs. 'Into Battle' contains the most memorable Churchill speeches of the war, from 'Blood Toil Tears and Sweat' to his heroic homecoming at Harrow School; 'Unrelenting Struggle' covers the period from Nov.'40 through Pearl Harbour and the 'some chicken, some neck' speech in Ottawa, Dec.'41; 'End of the Beginning' chronicles the turning point of the war, following victories at Alamein and Stalingrad and the North Africa landings; 'Onwards' features speeches delivered prior to the invasion of Europe on 6 June '44; 'Liberation' continues the 'hopeful' nature of the 1944 speeches, whilst 'Victory' provides us with the final, triumphant war speeches. Six 'secret' speeches concludes the series. Winston Churchill's authoritative and brilliantly written monumental biography of John Churchill, First Duke of Marlborough (1650-1722), Winston’s great ancestor, general and statesman, and one of the greatest military commanders in history. Four first editions finely bound in burgundy morocco, and illustrated with many photogravures, maps and plans and facsimiles of letters and documents. Seven first edition volumes, finely bound into six, of the monumental orations from Britain's war leader, compiled by Randolph S. Churchill and Charles Eade. Illustrated with half tone plates mostly from photographs. A handsome copy in a striking recent leather binding. Churchill's second and final autobiographical book (following 'My Early Life'). Churchill begins by asking what it would be like to live your life over again and ends by describing his love affair with painting. In between, he touches on subjects as diverse as spies, cartoons, submarines, elections, flying, and the future. Containing twenty three articles, including ‘My Spy Story’, ‘Mass Effects of Modern Life’ and ‘Moses’, originally dictated late at night in the 1920s in his study, all of which had been published in magazines and newspapers between 1921 and 1931. Illustrated with photographic frontispiece and several cartoons. ‘The flash and dash of Churchill's zest will render these four volumes readable, humane, exhilarating, memorable and exemplary, few historians, moreover, have been gifted with a style of equal subtlety and vigour, a style at once classical and romantic, precise and imaginative, tolerant yet gently ironical, deeply sensitive to the tragedy of human failure and scornful only of those who are faithless to the virtue within them. These four volumes leave us with enhanced admiration for human character, and an added compassion for human fallibility. They are the legacy of a man of superhuman energy, great intellectual powers and utmost simplicity of soul.’ - Harold Nicolson, New York Times Book Review, 1958. 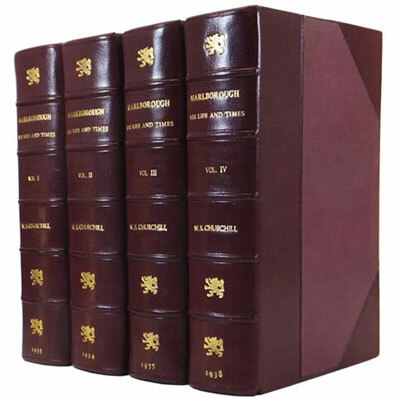 A finely bound four volume set published shortly after Sir Winston Churchill was awarded the Nobel Prize for Literature. This is the author's last great work, only available some twenty years after he wrote the first draft, which then lay dormant whilst he attended to National and Parliamentary matters. An attractively bound first edition of Churchill’s continued adventures during the Boer War. Illustrated with portrait, nine maps and plans, and large folding colour map to the rear. Churchill, having resigned his commission in the British Army, was nonetheless drawn to the Second Boer War, and arranged to be sent to Africa as a correspondent for The Morning Post. This book charts Lieutenant-General Ian Standish Monteith Hamilton's campaign progress from Bloemfontein to Pretoria, during which time he fought numerous sizeable conflicts with Boer forces.